The U357-025-SEC USB 3.0 SuperSpeed to 2.5 in. 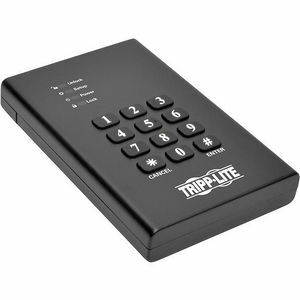 SATA Encrypted Hard Drive Enclosure is a quick, easy way to connect a SATA HDD (Hard Disk Drive) or SSD (Solid State Drive) to your laptop, netbook or notebook's USB 3.0 port. In addition, it provides state-of-the-art real-time 256-bit AES encryption to ensure all data stored on the SATA drive is for your eyes only. A secure keypad lock provides password security for secret documents and files. If the enclosure is lost or stolen, your data remains protected. Change your custom password as often as you like. Perfect for portable storage or backing up sensitive data, the compact enclosure is compatible with 2.5-inch SATA drives up to 2 TB (and will support larger drives when available). It supports USB 3.0 data transfer rates up to 5 Gbps. It also reads data up to 70 percent faster and writes up to 40 percent faster than USB 3.0 when connected to a UASP-enabled host controller. The U357-025-SEC accepts SATA III, II and I drives and is backward-compatible with previous USB generations. No software, drivers or external power supply is required. Compatible with any USB-enabled operating system.